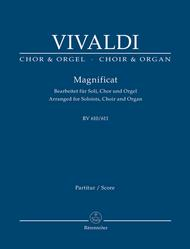 Magnificat RV 610/611 (Bearbeitet fur Soli, Chor und Orgel). Composed by Antonio Vivaldi (1678-1741). Arranged by Andreas Kohs. For singing voice/mixed choir/organ. This edition: 2nd printing 2012 edition. Stapled. Choir & Organ. Level 3. Score. Language: Latin. RV 610/611. 47 pages. Published by Baerenreiter Verlag (BA.BA7516).ISBN 9790006525072. With Language: Latin. 27 x 19 cm inches.